The Cape Henlopen High School Viking golf team returned to winning ways with a 176-199 performance April 16 against Delmar at Green Hill Yacht & Country Club, near Salisbury, MD. Matt Zehner and Mike DeStasio earned co-medalist honors with a pair of 42s. DeStasio’s highlights included driving the green on the 301-yard par-4 9th hole, making birdie. He also birdied the first hole. Zehner birdied the 145-yar par-3 third hole. Quincy Duckworth and Luke Branner’s pair of 46s completed the team scoring, and matched the best Delmar score posted by Helen Wilson. 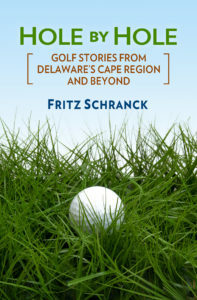 Duckworth also birdied the first hole, a 447-yard par-4. Branner’s 46 included a nine on the par-five 6th hole, which means the rest of his round was much improved from prior outings. 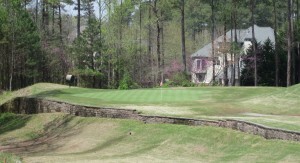 While on my recent Southern swing, I had two very different golf experiences in the northern suburbs of Atlanta. My golfing host was Marietta resident Bob Hodge, with whom I am now connected by marriage. He is a busy real estate agent and property developer, and also a bit of a golf nut. We first drove to Alpharetta, scene of one of the newest golf businesses, a Top Golf adventure. Top Golf is a combination driving range/tavern/indoor-outdoor game room facility, with several sites now open throughout the United States. The closest one to the Cape Region is in Alexandria, VA.
For a variable rate depending on time of day, players are assigned one of 105 driving stations, stacked in rows of 35 on three levels. Using either Top Golf clubs on site or your own sticks, you bang away at a screened driving range, in which are located ball-gathering targets. The golf balls are imbedded with identifying chips, so your efforts are tracked and compared to your playing competitor, using a variety of game options. In chilly weather, a heating unit keeps the stations warm. The attentive wait staff helps golfers remain lubricated and well-fed, with menu and drink options similar to those found at a Buffalo Wild Wings or a TGI Fridays. From my observation of the nearly full facility on a rainy Easter Monday, this is a fun and highly successful combination of ways to separate golfers from their money. A steeply downhill par-3 at Bridge Mill, near Atlanta, is no fun for those who pull their shots left. The next day, Hodge hosted a round at Bridge Mill Athletic Club, a public access golf course nestled in a 1000-home real estate development in Canton, GA. Hodge warned me that Bridge Mill was hilly, but he actually understated the situation. There were no flat areas anywhere on the course, except for some of the tee boxes. Every second shot on the par-4s and par-5s, and every approach shot to the greens, presented some kind of angled lie. There were significant uphill, downhill, and sidehilll challenges, something only rarely seen on Cape Region layouts. On several steep hills the designers had taken pity and carved out shelf-like reconfigurations. The cut-ins flattened, but not completely, what would have otherwise been impossible shots for us flatlanders. Recent rains also showed me how Georgia clay doesn’t drain nearly as well as the Cape Region’s sandy loam, but we handled that with a generous application of the lift, clean, and place option. I’d like to try it again when it’s drier. The Kings Creek Ladies Golf Association held its first 2015 LGA day April 16. The format, called 1, 2, 3, You’re Out, allowed each player to throw away their worst three scores. Renata Price took first place in the first flight, with Barbara Wisneski in second and Jeannie Doane in third. In the second flight, Nadine Carrick won the first spot, followed by Melanies Pereira in second, with Barbara Hines in third. Anne Farley won first place in the third flight, with Joanne Yurik taking second and Prabhat Karapurkar finishing in third.